I was really looking forward to it. But an “ethics” organization buckled under pressure from sponsors, some of whom are also board members, to rescind their offer to me to speak because I might “insult” or “disparage” one of them from the podium. Billed as “The Great Debate” on September 26, The Ethics and Compliance Officer Association Annual Conference showcases two speakers on an issue of critical interest to members. This year’s topic: Does ethics training change behavior? On August 21, the organization’s Chief Operating Officer, Tim Mazur, contacted me via email to ask if I would be willing to step in late in the game as one of the debaters. A previously committed speaker had canceled and recommended me as a substitute. “It’s a unique need but she thinks you’d be ideal for it,” he said. The conference is in the Chicago area, so there would be minimal travel costs, but it is a for-profit conference run by a not-for-profit association. 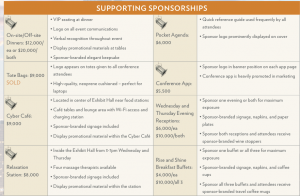 Attendees pay dearly to attend — registration for the full three-day conference, without extra workshops, costs $2,350 for non-members, $1,850 for members — and the conference solicits paid sponsors and vendor fair exhibitors. I asked if the group had a budget for speakers. Mazur’s response was disappointing but what he offered instead was attractive enough to convince me to agree. To answer your question, no, we don’t have a budget for paying speakers. As a nonprofit professional association, we’ve been able to attract great speakers over the years at no cost. Let me offer, though, the following. First, as I shared, I’m happy to pick up the cost of the room ($250) and any parking expense. Second, while all attendees, including speakers, are required to pay to attend any part of the conference, we regularly invite a speaker to join us for the meal before, or the meal after, their presentation at no cost. Third, as special consideration for the fact that you usually get paid, let me offer that, if there’s any part of our program you might like to attend, I’m willing to waive any charge given how generous you’re being in stepping up with only five weeks’ notice. I’m sure that, at most or all of the conferences where you speak, speakers are permitted to attend any sessions they want for free, but we’ve learned at the ECOA that a conference of 300 people, all of whom have paid to attend, is a much better experience than one with 500 people but 200 got in for free. That said, as I write above, we’d be pleased to welcome you to any part of the conference at no cost. I attended a planning call on September 4 that included the moderator, Patricia Moks from PwC, Mazur, and Professor Pincus-Hartman. After discussing the format, a session title adjustment that would make it in under the wire for the program printers and other logistical issues, Mazur asked if I would stay on the call to chat a bit more. He told me he had been unaware of my “reputation in the accounting industry” when he asked me to step-in so late, but should have checked me out. I had been recommended as a “watchdog on the accounting industry” and someone who “speaks truth to power”. Mazur asked me to promise not to disparage or insult any of the sponsors or speakers – all of the Big Four audit firms would be present. He also told me that a senior Deloitte executive would be a keynote speaker the day before our debate. I assured Mazur that I was accustomed to speaking at “mixed” events. I accept numerous invitations to speak at universities, professional associations of academics like the AAA, and conferences like the Society of Corporate Secretaries and Governance Professionals Annual Conference, the Compliance Week Annual Conference and IIA conferences. The Big Four firms should be used to me being around. Two days later I received a call from Mazur informing me that “speakers” were complaining about my participation and were threatening to not attend the “Great Debate”, pull out of the conference, even cancel memberships because of my participation. The stated reason was that I am a journalist and the conference is billed as a closed session for professionals where they can air sensitive issues and concerns without fear they would be quoted or written about by media. They must not be afraid of their confidences being used to pitch to them. Those who sell to this C-list level group — lawyers, consultants and software vendors — fill more than one-third of the speaking slots and hold off-agenda workshops that charge additional admission fees. No media had previously been given access to the conference, although Gretchen Morgenson of the New York Times did speak at the conference, by Mazur’s admission, two years ago. My suspicions were, however that the speakers who complained were also sponsors and Big Four firms. Two Big Four firms count their professionals on the board of directors, also. an opportunity to meet ethics and compliance practitioners in an environment dedicated to networking and the sharing of ideas? 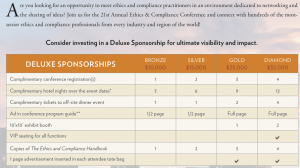 Join us for the 21st Annual Ethics & Compliance Conference and connect with hundreds of the most- senior ethics and compliance professionals from every industry and region of the world! 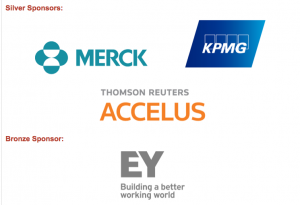 Who are the Big Four sponsors for this conference? Ernst & Young contributed $10,000 towards the cause of good ethics. Although PwC is not listed as a major sponsor, perhaps they are taking advantage of one of the other sponsorship opportunities. Tote bags, maybe. I can’t imagine PwC got the primo spot of moderating the “Great Debate” for free. This stuff is golden! Deloitte and KPMG professionals also sit on the board of directors of this organization. I also offered again, as I had when first approached, to sign a non-disclosure agreement to assuage concerns about confidences. Finally, I suggested to Mazur that he speak to Matt Kelly, Publisher and Editor in Chief of Compliance Week about how he had overcome concerns about media and critic presence at their annual conference, one that has many of the same attendees and sponsors. We agreed to speak the following week and I held out hope that backbones would prevail. Instead, I got an email early on Monday morning, September 9, from Mazur. More calls came from speakers on Friday afternoon, and I was able to secure one of our members, Bill Prachar, who is a former CEO and general counsel, to do the debate, so we’ll proceed as I regretfully described on Friday. Again, I deeply apologize for my underestimating the speakers’ reactions. As you suggested, I called Matt Kelly on Friday (first time I’ve ever spoken to him). He gave me good advice on how to operate a conference that accomplishes both goals: partially open to media yet certain sessions open only to ethics/compliance officers. Our Speaker Confirmation letters and overall process will permanently change because of the conversation with him and, more importantly, with you. I learned a lesson, too. I agreed to do this appearance at a huge for-profit event because I thought I was doing someone a favor and I was attracted to the topic. I did not insist on a fee or the contract that would have guaranteed me recourse, such as a kill fee, under these circumstances. Do not underestimate the power and vengeance of the Big Four. Your story is reminiscent of the way that Colorado State University canned Lynn Turner at the demand of the Big Four. They threatened to stop recruiting at CSU unless Turner was removed from the faculty. So much for academic freedom or freedom of he press. Would a referee throw a flag for excessive irony? I knew Lynn stopped teaching there but did not know it was because such pressure was exerted. I like him. Even if we don’t always agree on solutions we agree on the problems. We are on the same page and I value his experience. I am sorry to hear that but I think he’s doing ok working with plaintiffs lawyers and the NYAG. Francine does it really surprise you that those who you shed the light of day on would criticize and demonize you and do all within their power to chase you from the limelight? Businesses are no different than politicians they will do anything to protect their fiefdoms – ANYTHING!! Clearly, the public trust will be well served by secrecy when discussing ethics and accounting issues. Lesson learned, Francine. Never again. You are now classified as a journalist. It used to be a badge of honor. However, in the trenches of commercial warfare, it now makes you persona non grata. As an investor and CPA, I am very concerned about about quality and ethics. The problem is that you have a situation where all the major firms now have price control over their customers and have got no accountability to others. The big 4 should be set back to the big 8 and the LLP and LLC constructs should not be allowed. The latter was great protection because it enforced a lot of selfpolicing. Today the CPA industry is just another group of people out to protect their own first and serving the public good second. How sad for those us who came up in a different era. Its always nice to know when you are so “popular” with some vendors. Francine is in good company. In addition to the CSU debacle with Lynn, Abe Briloff was treated similarly. He was uninvited from an Executive Enterprises Inc. conference when they refused to be on a panel with him. I think they also threatened other retaliatory measures. Thanks for that. It’s not the first time I’ve been snubbed, though. The NYC PwC MP refused to sit on a panel with me and dissed Volcker and Herz by not showing up at NYU last year and some gave Matt Kelly a hard time for having me moderate a panel at Compliance week two years ago are two that I know of. (Matt stuck with me an so did NYU.) But this was pretty brazen, especially since i was on the program initially at their request. I have a good friend who says when I write a book they will not be able to act this way. I doubt that will help much. However, if I worked for FT, or WSJ pr NYT it would never happen. Then again, I would not be free to speak my mind or speak anywhere I like, either. I’ll take the Big Four for $200, Alex. What are matters of opinion? Francine. I am Big 4 audit partner (not US) and enjoy reading your work. It is excellent on the whole, although some obvious errors, gaps and omissions do occur from time to time. However, that’s sort of how I feel about my profession. There is much great work done to protect shareholder interests and preserve market integrity. Based on my own experience alone, a lot more than the public is ever let to know. But this never gets a mention in your work. Which is a shame, because the casting of dispersions on over a million talented people worldwide without balance means that your valuable insights get locked out. As happened on this occasion. The profession needs people like you to push and challenge. But we need people who can do this positively and constructively, rather than just casting stones. First: If I make a mistake, omit something that is important for understanding or there’s a gap in the narrative that you think is bad, let me know. You can email me at fmckenna2010@gmail.com (I will keep you anonymous) or leave me a comment and say don’t publish. I monitor all comments and some people communicate with me anonymously and privately that way. Second: I get the complaint now and then (the worst trolls and haters have moved on now after almost seven years) that my blog does not provide balance, that I don’t tell the good news and stories of good people often enough. Let me explain a bit why I started this blog and what my objective is. I started this in late 2006 after leaving PwC. I was going to write a book and then go back to work. I have instead changed careers and now write full time. At that time I believed there were few journalists who had the experience and time to write about the industry in depth except during a crisis such as Enron or when one of firms was sued big time. The story is hot for a few days and then they have to move on. There was no full time accountancy reporters at any major daily publications except the FT, and they rotated every two or thee years. No time for anyone, least of all someone without an accounting or audit background or even professional services background, to understand the industry and make sufficient contacts to do anything other than take what the firms’ PR spit out and report that. Enter my twenty-five years experience as an internal auditor, consultant and MD/executive in professional services all over the world. My last gig at PwC was the capstone to this career – auditing the firm itself in 2005-2006. I believed I needed to balance the puff profiles, positive stories about diversity and community involvement and charitable works and press releases from the firms for all kinds of business development initiatives that are used to fill column inches. So my blog will not change and start printing the stories of the tireless thousands who do good work. (I know they exist because they are my friends and former colleagues and they have appeared here and in speeches more than a few times.) There are other places for you to get that attention if you want it. And after all, doing your job well is your public duty; it is the minimum that is expected. I’m writing to raise awareness of the role and responsibilities of the firms and to keep them front and center when stories occur. It’s worked well for seven years and allowed me to gain an even broader audience, to encourage others to write more about the issues, and to raise the profile of the firms in ways I could have never imagined. Nothing like those kinds of incentives to keep me going and going hard. Go back to the 1960’s and watch the erosion of the independence definition. From very strict to just about anything as long as you don’t get caught. Ethics rules are the way the big boys keep the small firms in line. I wrote the AICPA ethics committee about Price Waterhouse and their unethical (not promoting females) and asked if they were waiting for case to go to Supreme Court and was told that they were. After Supreme Court said they were wrong, NOTHING Happened. P.S. I have watched my beloved profession go from being one of the most respected to one of “slimy sam the used cart salesman” It is so sad.